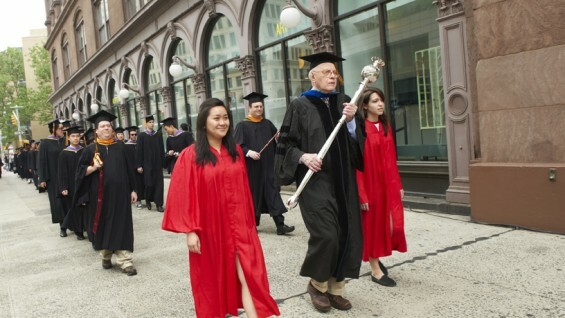 The Mace of The Cooper Union, emblem of the authority and the responsibility of the President, is carried at the head of all Cooper Union academic processions. The design of the Mace of The Cooper Union symbolizes the power of mind articulated through science and art. The tradition of academic costume apparently began during the twelfth century in the early European universities. Practically all costumes derive some sort of clerical or priestly garb. The American academic costume follows a uniform code drawn up by a special commission in 1895. The costume consists of three main parts—the cap, gown, and hood. The cap, usually referred to as a mortar board, is always black and has a long tassel suspended by a button from the top. The tassel may be black for any degree or it may be the color associated with the degree and usually of gold metallic thread for the doctor's degree and for governing officials of the institution. According to the code all gowns are black. A few colorful exceptions may be noted among the faculty and these signify advanced degrees from universities in Europe and several in the United States. The gowns for the different degrees vary in the design. The hoods alone clearly show the degrees and institutions awarding them and give color to the academic costume. The colored lining of the hood indicates the institution that awarded the degree. Cooper Union's colors are maroon and gold. The color of the velvet border around the hood represents the department of learning as follows: Arts and Letters, white; Education, light blue; Engineering, orange; Fine Arts, brown; Architecture, blue-violet; Philosophy, dark blue; Science, golden yellow; Law, purple; Library Science, lemon. The Great Hall of The Cooper Union, scene of today's Commencement exercises, has for more than a century stood as a bastion of free speech and a witness to the flow of American history and ideas. When the hall opened in 1858—more than a year in advance of the rest of the unique institution founded by Peter Cooper—one newspaper proclaimed it was "not equaled by any room of a similar nature in the city or the United States." It quickly became a haven for all interested in serious discussion and debate of the vital issues of the day and it has continued that role ever since. It was The Great Hall, on February 27, 1860, that Abraham Lincoln delivered his "Right Makes Might" address, an appeal against the extension of slavery and a pivotal event in his quest for the Presidency. The Great Hall has also welcomed such innovators of social change as abolitionist Frederick Douglass, rights activist Chief Red Cloud and women's suffrage champions Susan B. Anthony and Victoria Woodhull. The NAACP, the American Labor Movement and the Red Cross were all born in The Great Hall. American presidents, beginning with Abraham Lincoln, have made transformative statements from its lectern. They include Presidents Ulysses S. Grant, Grover Cleveland, Theodore Roosevelt, William H. Taft, Woodrow Wilson, William Jefferson Clinton and, most recently, President Obama. And it was here that the leading abolitionists spoke out against slavery, that the effort to overthrow New York's Tweed Ring was launched and the early calls went forth for women's suffrage and for the establishment of the National Association for the Advancement of Colored People. For much of this century, The Great Hall has been the home of The Cooper Union Forum, the nation's oldest free public lecture series. While public affairs lectures are still held here, they have been complemented by a distinguished performing arts series and by programs in such other areas as literature, poetry, architecture and art. The Great Hall is used for programs by outside groups, thereby enhancing its value to the community and the city.